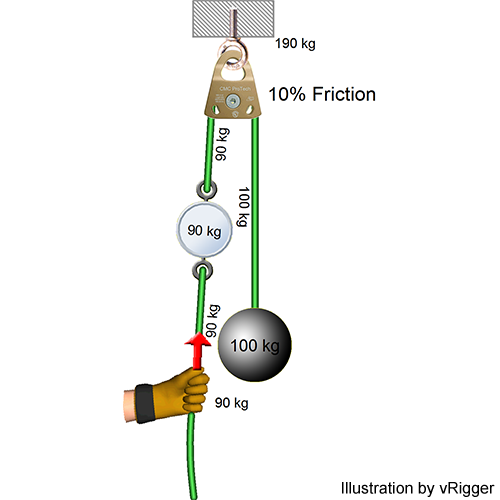 This illustration shows the same system that was used to calculate friction when lowering through a pulley, but this time the load is being raised. Using the above formula, you can see that you must pull 111 kilograms to raise the 100-kilogram load. The pulley's friction requires us to pull an extra 11 kilograms. 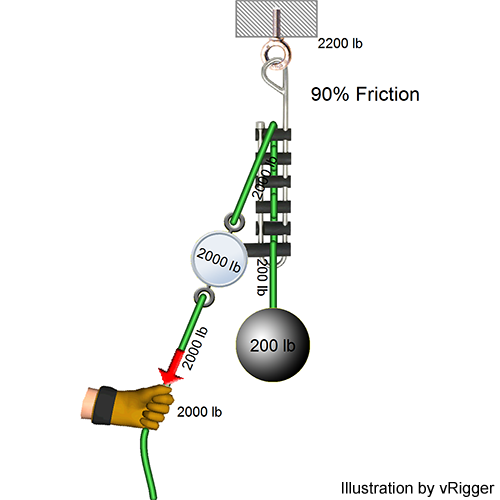 This illustration shows the same system that was used to calculate friction when lowering through a brake bar rack with 90% friction, but this time we are trying to raise the load (a dumb thing to try, but it's a good example of friction). When lowering, the 90% friction reduced the forces from 200 pounds to 20 pounds. As shown in the following formula, if you tried to raise the load through the rack you would have to pull a whopping 2,000 pounds. In the basic 3:1 raising system shown here, you would expect to pull 67 pounds to raise the 200-pound load (i.e., one-third of the 200 pounds). However, if each of these pulleys induces 10% friction, then your pulling team will need to pull ~74 pounds to raise the load. In effect you have a 2.7-to-1 system. If you increase the friction in the pulleys to 20%—a not-unreasonable value for some smaller pulleys with brass bushings—you will need to pull 82 pounds to raise your 200-pound load. Your 3:1 system is now only providing a 2.4:1 mechanical advantage. The pulleys' 20% fiction add 15 pounds to the 67 pounds you expected. It is intuitive that friction increases forces when raising and that minimizing friction in pulleys is a good idea, but there may be times when you do not have low-friction pulleys and you are forced to use lesser gear, like carabiners, for pulleys. This is not an uncommon situation during a pickoff where you need to raise the subject a few inches to transfer his weight onto your system. 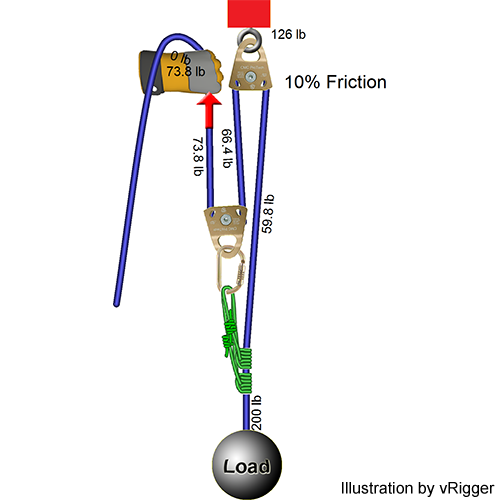 As shown in this illustration, when you attempt to lift a 200-pound subject on a 3:1 created with carabiners (which in this example have 50% friction), you will be pulling a surprising 114 lbs rather than the 67 pounds you may have expected. Your system is no longer a 3:1, or even a 2:1—it is a discouraging 1.75:1. If you do need to create a system that includes both pulleys and carabiners-as-pulleys, it is best to put the higher-friction devices (i.e., carabiners) closer to the load and put the lower-friction devices (i.e., pulleys) closer to the pullers. 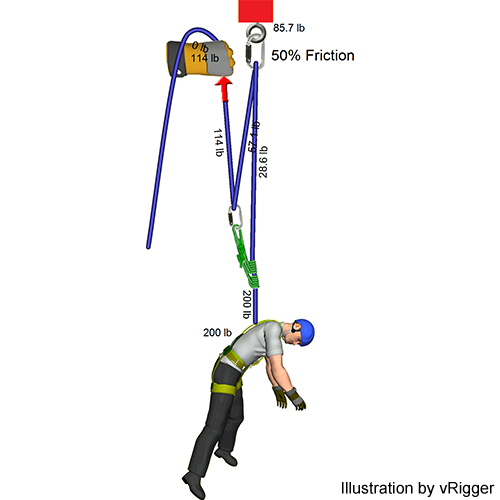 The next time you are rigging, don't forget to consider the effects of friction. If you are lowering a load, think about ways to increase friction which will decrease the forces you must hold: change the angle of the rope, route the rope differently (while protecting it from damage, of course), or add bars to your brake bar rack. And when raising, think about ways to decrease friction: use low-friction pulleys, use rollers or smooth edge protectors, and minimize the angle that the rope crosses other surfaces.